Chelsea’s absolute humiliation against Manchester City is going to bring changes at the club, there can be almost no doubting that. Roman Abramovich may not be seen or heard from, but he is watching and he won’t like this. Above all, Chelsea are a prestige project, and getting battered doesn’t sit well with a man like Roman. 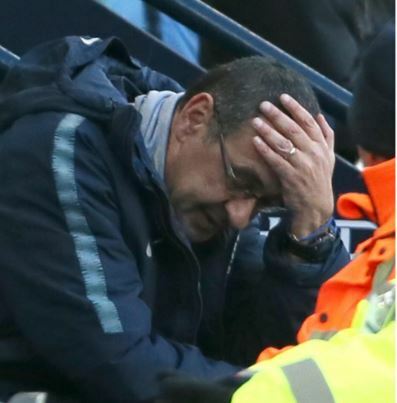 As the second half wore on, and Manchester City pushed on, it became a question of whether Sarri would last 24 hours, let alone the season. His long term fate was probably sealed by the Ross Barkley header a few minutes before. We don’t claim to have any sources or knowledge behind the scenes, but if you’ve seen how Chelsea operate over the last 15 years you’ll know that they don’t tend to mess around. Losing face is everything, and the club don’t have much of that left at all right now. And one person is first in the queue to take the blame.